This issue gives us two climactic confrontations: Hulk vs. Nyx and Hercules vs. Oizys, the goddess of misery. It attempts to combine them narratively with a tricky parallel structure, and there it makes a misstep. The structural ambitions reach their tipping point and slide into confusion when a random half-page of Voyager's narration is thrown into the second act. Not only does it interrupt an excellent hero moment for Hawkeye, it flat-out spoils a big plot twist that comes at the very end of the issue. Its inclusion is inexplicable and, to my mind, indefensible. I nearly squared it as an error in the review file Marvel gave us (I had to scrap a review of Fantastic Four #8 due to similar problems last week), but the fact that it's a half page (with the other half smoothly picking up where the previous page left off) suggests it really is supposed to be there. I just can't fathom why. I say with some confidence that Hercules' story is the stronger one, and it deserves a spotlight of its own rather than a shared stage. The Hulk gets an inner monologue to match that of Hercules. It feels artificial and superfluous, and the quality differential between the two weakens the individual stories rather than strengthening them. Carlo Barberi slides capably into the artist's seat for this issue. He is not afraid to put a personal stamp on the characters and the action. It's entirely successful in the latter case; his fight scenes are splendid, he puts memorable grotesqueries into the Hulk/Nyx fight, and he drops some desperately-needed settings behind the Avengers who remain in Conan's Shadizar. The colours by Jesus Aburtov maintain the high-octane, high-intensity look of the series, carrying the Avengers memorably through darkest night and brightest battle. The lovely backgrounds, though, are stuck with much less-saturated colours. It's a reasonable trade-off to ensure the characters pop strongly into the foreground. Mr. Barberi's character designs slip a bit when it comes to the women. The same broad, heart-shaped face structure works for Monica and Voyager and (maybe?) Wanda and Bêlit, but it diverges too far from previous artists' elongated renditions of Nyx. The gender-wide similarity stands out as the singular weakness of the visuals - but that does mean that the overall artistic standard is sky-high. While I dove straight into critiquing the script's structural faults, this issue's writing is far from unlovable. Characterization is great throughout, especially for Hercules, but Hulk and Hawkeye also get their chances to shine. Even though the other Avengers - Wanda, Monica, and Vision - are relegated to the briefest of peeks, they're each gifted with at least one powerfully insightful panel apiece. Hercules' struggle with Oizys is the stuff of epics. The Prince of Power doesn't shy away from making the fight allegorical, and his thoughts on how misery need to be fought land firmly in universal applicability. Those thoughts ensure that no matter what faults I might see in the structure, I remain firmly in favour of this issue. It's got a great heart and a worthwhile message, and those aren't the sort of babies you throw out just because the bathwater is getting confusing. 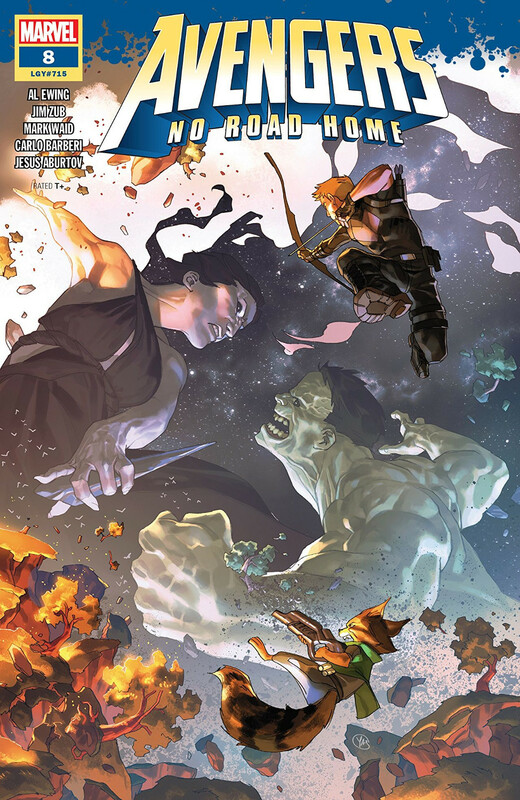 Avengers: No Road Home #8 stumbles as it tries to align the stories of Hercules and the Hulk too closely. The combination isn't successful, but the individual parts - particularly Hercules' - still deliver great storytelling. Strong, distinctive art helps to hedge the script's weaknesses, and No Road Home rolls on in its accustomed groove: far from faultless, but equally far from average. Do we still get comic relief? Well, we have Rocket jerry-rigging arrows for Hawkeye, so that's a big "yes."